Rosneft’s head Igor Sechin said the contract envisages the export of 365 million tonnes of oil to China over the next 25 years. Russia’s state-owned oil giant Rosneft will supply $270 billion worth of crude oil to China, the company said on Friday, after clinching a deal likely to make Moscow China’s biggest energy supplier. The deal will reshape the geography of oil exports from Russia, currently the world’s largest producer of crude. Most Russian oil currently goes to Europe via a network of pipelines from West Siberia, while only a fifth of it is exported to Asia. 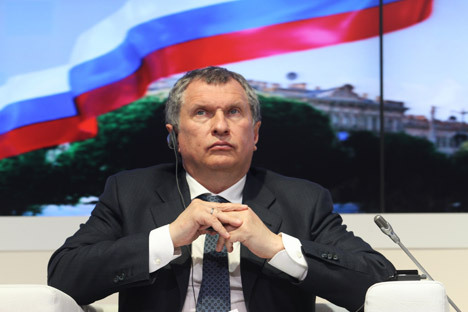 Sechin, a key ally of President Vladimir Putin, said Rosneft and China National Petroleum Corporation (CNPC) will jointly develop three offshore fields in the Barents Sea and eight oil deposits in East Siberia. In 2009, Russia completed construction of a 2,700 kilometer (1,700 mile) pipeline across Siberia to China’s Manchuria region. In April, Rosneft and CNPC signed an agreement to deliver 37 million tonnes of oil a year. Rosneft is the only Russian company producing oil for exports to China. Tatneft, Russia’s oil transportation company, also has contracts with China, with its oil exports estimated at 6 million tonnes a year. However, the oil transporter buys the commodity from Rosneft. Rosneft oil supplies to China stand at 15 million tonnes a year, which is planned to be boosted 250 percent - to 37.8 million tonnes. First published in RIA Novosti, RT.COM.